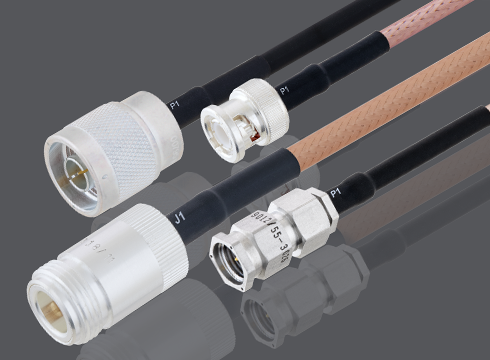 Increasing reliance on electronic devices for industrial, aerospace, and military applications compels manufacturers of RF/microwave cable assemblies to offer cables that exhibit high reliability in many types of environments and operating conditions. Some areas of applications that require Hi-Rel components include space, military and defense, test and measurement, wireless mobile communications, automotive, medical, and other industrial applications. Hi-Rel means “high reliability” which, one would assume, is based upon a reliability measure and it might, depending upon the device or application, but for Hi-Rel coaxial cables reliability can also be gaged by how the cable measures up to standards. As reliability is thought of as a measure of consistency or repeatability, for coaxial cable, not only do you want your assembly to perform as intended, or accurately, you would want it to perform this way every time. Unfortunately, Hi-Rel coaxial cable is rated differently depending on its application in a particular industry. Commercial, automotive, U.S. military, or European Union industries have different standards with ranges of acceptable conditions which makes comparison of cables or devices in terms of “Hi-Rel” somewhat inadequate. Keep in mind, standards are written as “minimum specifications” for components and systems providing a minimum performance level for cable assemblies. Competition in the industry compels manufacturers to make high quality cables that outperform the standards in order to have an advantage over competitors. In other words, these standards allow manufacturers to make cables that are compatible with other cables but have other advantages, either in performance, installation or cost. Many think industry standards are mandatory but standard compliance is a voluntary, rational approach to coaxial cable design and manufacturing that allows interoperability, upgradability, and cost savings for communication systems. In the RF industry, reliability refers to an accepted level of performance based on typical usage, without degradation or loss in performance for the lifetime of the cable. In reality, the reliability of a cable assembly may related to one or several performance characteristics which can differ from one application to another when one parameter or the other is performing well for one application but not another. Yet consumers rely on reliability – it is crucial for maintaining service in cellular communications network, in protecting national interests, and in emergency services. Hi-Rel cable assemblies are used in test-and-measurement facilities where the accuracy and reliability is part of the quality assurance to validate the performance of DUT. The operating environment of an RF cable assembly has a tremendous impact on its optimum reliability. Unwanted interference from a cable assembly lacking proper EMI shielding would not be acceptable in a surveillance or radar application. High quality materials like low-loss dielectrics or precious metal platings do not necessarily ensure high reliability. Design for application is key and design testing is a must in the R&D phase of product development. Hi-rel cable assemblies are designed for extreme temperatures, harsh environments, and excessive stress where performance is paramount. The production process of a hi-rel component involves detailed handling procedures, additional conformance testing and inspection to ensure that the product has superior performance and quality to ensure optimum performance and a high survival rate under extreme environments. These cable assemblies are subject to thermal and mechanical shock tests, exposed to moisture and humidity, and high temperatures to test whether they can withstand the harsh conditions where they are expected to perform. Testing and measurements are critical for assessing and determining product reliability. Manufacturers of high-reliability cable assemblies, to be competitive, must embrace new concepts and test these designs to bring innovation to the market. Measurement parameters include insertion loss, return loss (VSWR), phase stability, and thermal cycling, to name a few. Regular and repeatable measurements and analysis of test results are crucial in the product development process. Computer simulation software can provide a new basis for development of new products and high-performance test systems with reliable (accurate and repeatable) test data feedback to refine the development process. On a final note, be mindful that, depending upon the testing process, a cable assembly or part of the assembly may be referred to as Hi-Rel without being tested against the quality standards.